A field of poppies has been planted at The Grammar School at Leeds in memory of the school’s old boys who lost their lives in the First World War. 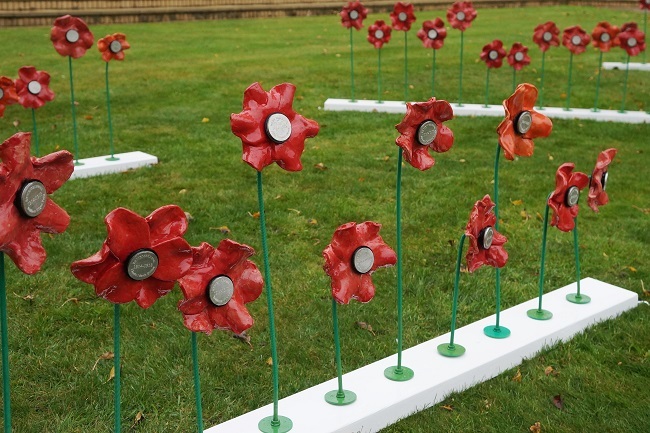 These are not poppies that will come and go with the seasons; made of clay and metal they have been individually handcrafted by the school’s current pupils as a lasting tribute to their predecessors whose lives after school were tragically cut short by the war. There are 130 poppies in total and each one bears the name of an old boy of Leeds Grammar School who lost his life in service. The project marks the centenary of the signing of the Armistice and in due course the poppies will be distributed around the school as permanent memorials to the 130 old boys. Principal Sue Woodroofe said: “I’m so proud that we have our own field of poppies outside the school’s main entrance with each poppy made by one of our current students in honour of every former pupil fallen in the First World War. Students fully embraced the commemorative project, creating the poppy heads in their art lessons and the stems and poppy centres in design technology. WRA industrial Coatings donated their services to coat the stems for durability.